Hello again everyone! 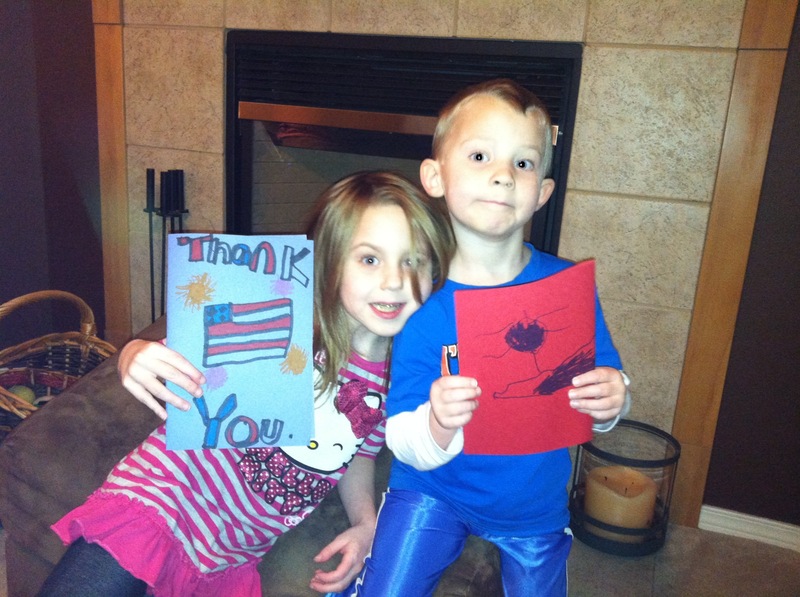 My children and I had a wonderful time with last week’s assignment creating cards for the troops. Check out their handiwork below! I want to thank everyone who is taking part in this giving challenge-whether you are just following our journey through this blog, or actively giving yourselves, every little bit makes a difference! If you are a fellow blogger who is “liking” my posts, thank you! I am new to this whole blog thing, and I don’t even know how you stumbled across this site, but I really appreciate it and want you to know that your “likes” are not going unnoticed. I promise to wander over and visit your sites over the next few days. Okay, onto our Week 2 Assignment, this will be a two-parter. Part 1: Thanksgiving is a time when Americans express gratitude, so this week I want everyone to take a moment to be thankful for all the wonderful blessings in our lives. Write down some of the most important to you. Share them with your family and/or friends. Enjoy being happy in the moment, not worrying about tomorrow, or regretting yesterday. Part 2: After we have taken time to focus on the good in our own lives, we are once again called to focus on those less fortunate. There are many who do not have enough to eat, and Thanksgiving is one of the most convenient times for us to give—most food items are generally on sale and many organizations are actively collecting at grocery stores, churches, and other locations. This week, I am challenging you to donate 3-5 food items to your local food bank, church pantry or outreach charity (and maybe stock up on a few more items to donate later this year). An organization near and dear to my own heart is aptly named Take The Next Step. Their mission is to “offer Friendship, Help, and Hope to our neighbors in need…our neighbors of all ages, backgrounds and situations – at risk children, homeless and street involved youth and adults, teen parents, low income and homeless families, veterans, the elderly and disabled.” This year they are asking for donations of any amount to help provide food baskets for area families in need. You can even create your own basket for a family in need! Simply click on the organization name above to visit their page. Another great charity in the Seattle area is the Union Gospel Mission. They provide “emergency care and long-term recovery services to hurting and homeless people in the greater Seattle area,” and are accepting donations to provide food baskets for families, as well as a fully cooked Thanksgiving meals served at the mission. Click on the organization name to visit their page. If you are not in the Seattle area and would like to give locally, but don’t know where to start, just enter “holiday food basket donations” along with your region in your browser’s search engine. You will be surprised how many organizations participate. Lastly, if you can’t afford to give, perhaps you can offer to help deliver baskets or serve food. Remember, the focus of this exercise is not on giving beyond our means, but on giving what we can, whether that is money, time, or other means of support. Right now you may not be able to provide much, and that’s okay. Like I mentioned earlier, every act of giving makes a difference. I wish everyone a very Happy ThanksGiving (see what I did there? lol!) and safe travels if your holiday takes you away from home. Blessings to you all! Love your heart too Jan!